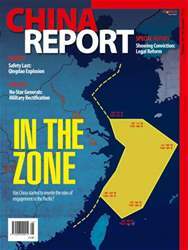 Our cover story (P12) follows the swelling of tensions over China’s unilateral East China Sea Air Defence Identification Zone (ADIZ). What new balance will be struck between an increasingly assertive China, an increasingly nationalistic Japan, and a US desperate to maintain both peace and its own influence in the region? China Report also investigates the Qingdao pipeline explosion this month (P26), in which a routine minor gas leak got fatally out of hand. Our history and culture coverage this month includes a look at the most infamous assassination on Chinese soil (P54), and the release of film No Man’s Land after four years of censorship.